Celebrate Champlain Community Services (CCS), its work supporting Vermonters with intellectual disabilities and autism, and its vision of a community where “everybody participates, and everybody belongs." Features dynamic keynote speaker Melinda Moulton, CEO of Main Street Landing Co., and the presentation of four exciting new Community Impact awards, each named for a trailblazer in CCS' history. A true grassroots success story, CCS was founded by the families of Vermonters with developmental disabilities and has emerged as a national leader in its field. 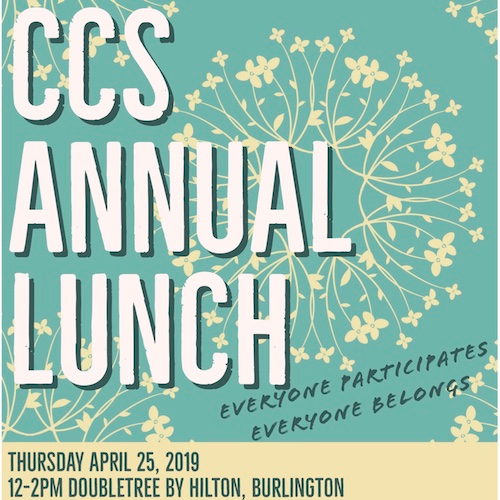 The CCS Annual Awards Lunch honors CCS' mission and work, four women whose leadership contributed to a more just and inclusive community, and four people who carry on that spirit. Best of all, funds raised at this event go directly to CCS programs.